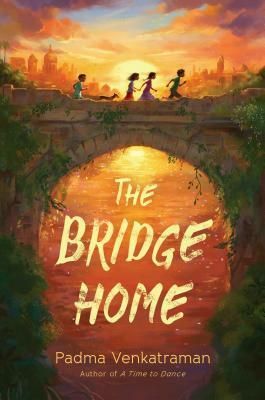 Ms. Yingling Reads: The Bridge Home. Venkatraman, Padma. The Bridge Home. When Viji's mother does nothing to protect herself from the abusive behavior of Viji's father, the desperate girl decides to take her sister Ruuku and run away to the city. Ruuku is developmentally disabled, but Viji feels that anything has to be better than their home situation. They make it to the city and are lucky to find some friendly help, including a woman whose husband runs a restaurant who gives them a little work, food, and beads for Ruuku. They also meet fellow street children, Arul and Muthi, who show them the ropes and make a home with them on a bridge, using tarps and mats. The boys show them how to make money by going through the garbage and selling metal and glass, and generally help them survive in their new reality. Arul is a Christian, and his entire family was lost in tsunami type accident, and Muthu has his own sad back story that makes him wary of people. Even after the rag man destroys their bridge home, they gather their forces and live in a cemetery. Eventually, however, the rainy season brings mosquitoes that cause fever in the children, and Viji is forced to accept help from a local children's charity. She is reunited with her father, but chooses to stay in the children's home, where she has been able to put together a life that includes more education than she would have gotten otherwise. Strengths: I am always happy to see books about how children live in other countries, and Venkatraman has based this on her own mother's work with disadvantaged children in India, as well as on many interviews. The details of what is needed to survive are tremendously appealing to young readers. Think of The Box Car Children or A Tree Grows in Brooklyn, which I read for the details like washing the dishes in the creek with sand or going to the store for just one potato. This is a great book to hand to readers who love Cruz's Everlasting Nora or Yang's Front Desk. While I loved this author's A Time to Dance and Climbing the Stairs, novels in verse and historical fiction don't do all that well in my library-- this hits the popular features of problem novels just right and will circulate a lot. Weaknesses: I have had a small number of students of Indian descent in my school over the years, and their background is far more like Varadarajan's Ravi in Save Me a Seat. I'd like to see books set in India about children who go to school and have a slightly more secure home life. What I really think: Can't wait to hand this to students. Enjoyed it very much myself!